Nestled in a remote far western corner of the UAE lies a picturesque desert island with a craggy terrain spanning 87 square kilometres. A stunning combination of rugged hilly landscapes, mangrove forests and dazzling blue coastal waters, the charming Sir Bani Yas Island is the ultimate destination for an escape in the UAE, popular among residents seeking a weekend getaway and tourists looking to make the most of their travels to the country. 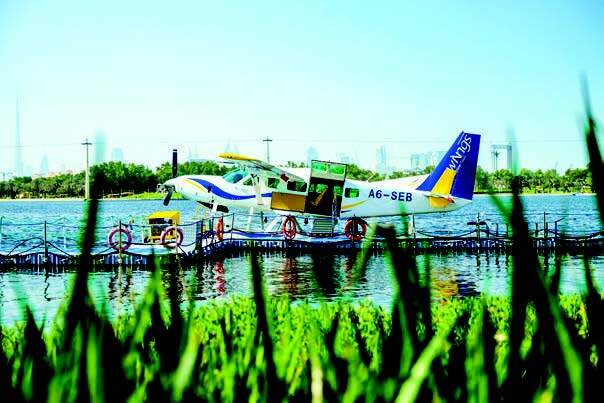 Take a seaplane flight with Seawings for spectacular aerial views of Sir Bani Yas Island even before you arrive. Private return charters are available from Dubai or Abu Dhabi with up to nine seats (all windows) per flight. While the island can be reached from any of the emirates by road and water, one of the best ways to get there is by flying. 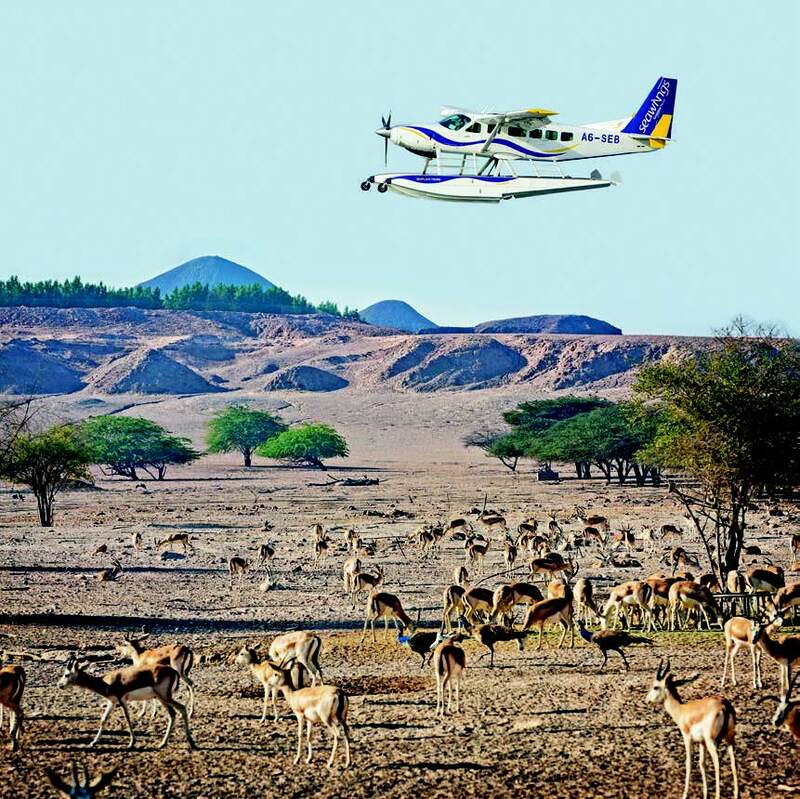 In fact, that first glimpse of Sir Bani Yas Island from the skies sets the right tone for the rest of your visit. Luxury seaplane tour and charter company Seawings operates private return flights to the island from Dubai and Abu Dhabi. And nothing beats the thrill of taking in the island’s breathtaking landscape from the clouds. Add to it the adrenaline-fuelled water take-off and landing and you have yourself the perfect adventure. What sets Sir Bani Yas Island apart is the Arabian Wildlife Park, one of the region’s largest and most famous nature reserves. 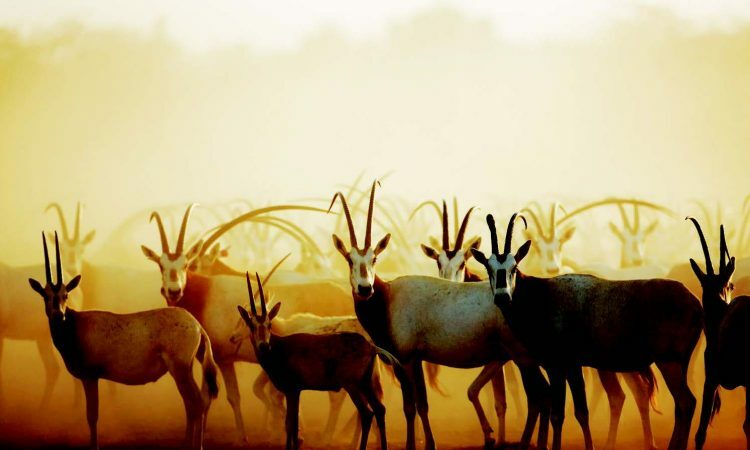 The retreat boasts more than 13,000 free-roaming animals, including indigenous species like the Arabian oryx and sand gazelle as well as reticulated giraffes, cheetahs, antelopes, Indian blackbucks, Barbary sheep, Ethiopian hedgehogs, Egyptian jerboas and Somali ostriches. The waters surrounding the island are also home to dolphins and sea turtles. And with nearly 30 different species to spot, no single visit to the park goes by without a wildlife encounter. Opportunities to spot gazelles galloping through the sand and cheetahs lingering over a kill are present in plenty. But that’s not all there is to discover on Sir Bani Yas Island. The destination also boasts one of the region’s oldest archaeological sites with the most significant discovery being the ruins of an ancient Christian monastery from the late sixth century AD. The earliest evidence of human activity on the island dates back to around 5,500 BCE while other remains, including pottery items and a large tomb from around 2,000 BCE, confirmed Bronze Age dwellers. Adventure lovers will be thrilled to find an array of activities on offer, with land sailing, falconry, archery, mountain biking, kayaking and horse riding among the popular pursuits. While a day trip is a great option, those looking to get the most of their visit can book a stay at a trio of plush Anantara resorts. CULTURE & HISTORY TOUR Take a step back in time to learn more about the region’s ancient and modern history, right from preserved archaeological sites dating back to 600 AD to the legacy left behind by the late Sheikh Zayed. DISCOVER CONSERVATION Conservation efforts on the island have helped preserve several formerly endangered flora and fauna varieties. This is your chance to get up close with nature and learn more about these interesting species. LAND SAILING Did you ever think you could sail on land? Experience the thrill for yourself with an incredible experience on a land sail kart to explore the fascinating terrain of the island. THE ARABIAN WILDLIFE PARK Nature and adventure enthusiasts can embark on a 90-minute safari through the park in an open-sided Land Cruiser for plenty of wildlife spotting opportunities.